Having proper communication skills for trying to bag a job at a top corporate company is vital indeed. Companies always have their eyes open to look out for those employees who not merely have technical knowledge and speak well, but also those who are able to deliver power packed presentations which will be able to create very good and lasting impression in the minds of those who are audience members. So if you are someone who needs to brush up on your skills when delivering a presentation, then here are some points to help you to start and end your presentation in a dynamic manner. The manner, in which you begin, will set the tone for the rest of the presentation. So ensure that you spend ample time thinking of something which you will be able to attract the attention of the audience with. Starting in a run of the mill, conventional manner is not a very good thing to do as that will not be able to instantly grab the attention of the audience. While you begin, you must put yourself in the shoes of the audience and think about how, if you were in their place, what you would have liked to see. In an attempt to come across as cool and confident, ensure that you do for forget about your manners. 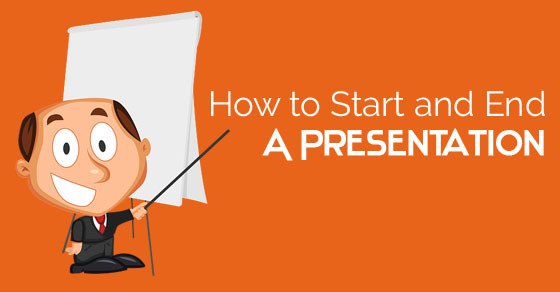 At the very start of your presentation, you should thank everyone for being present. This will ensure that you have a cordial relationship with the members of the audience. One of the worst things to do would be to not respect your audience members after they have taken the pains to be present. Along the way many people will tell you that you should never learn any part of your presentation up by-heart. It should all come naturally and from within. While this is certainly well and good for those who are experienced speakers. Most people find it very hard to speak properly in the first few minutes of the presentation. Once they have plucked up their courage and got used to the crowd they are able to speak in a better and freer manner. A great tip to help start your presentation would be to learn by-heart your first few lines, so that you can ease yourself into things. It often happens that in their nervousness many people forget to state the very purpose of the presentation. This is one of the biggest mistakes which you can make. So ensure that in your introduction itself you comprehensively state why you are having this presentation and why this particular topic means so much to you personally. Deliver your words in a proper manner so that people do not feel like you are mechanically delivering a speech which you have mugged up. Different speakers choose to begin their presentations in different ways. A good way to start your presentation in an appealing way would be to make use of a video which is uncommon and preferably which you have made on your own. Our minds are such that they respond much better to pictorial representations, rather than words, so doing this would ensure that you are able to force the audience to forget whatever else it is that they are thinking of and give you their undivided attention. A tried and tested trick which many skilled orators have made use of in order to kick start their presentation, is the use of startling bits of information or statistics which will help make the audience understand that what you are saying is very relevant indeed and needs to be looked into. If for example you are delivering a presentation on some product of your company or talking about environmental issues then it would help you a great deal to present real facts and figures. In this day and age people believe such hard facts, as opposed to anything else they are told. It is often said that first impression is the last impression, and while delivering a presentation too, the manner in which you begin could either make things or break things for you. A helpful tip which you can make use of is, start by asking some rhetorical questions to the audience members and force them to exercise their minds right from the beginning. Your presentation should not be mind numbing, rather it should incite the minds of all the people present and encourage them to think about things on their own and come up with ideas. Stories are something which appeals to the young and old alike. If you are a good story teller, then a great way to begin your presentation would be to tell a good story or narrate an anecdote which will help you to ease into your topic and help the audience get an idea of what you are saying. Your story should be short and interesting so that the audience is intrigued and can instantly draw the connection with the topic which you are going to speak on in the course of your presentation. When you are starting your presentation, ensure that you are getting to the point fast, without wasting too much of time. Rather than wasting too much time beating around the bush you should spend as much time as you can emphasizing on the topic at hand, because that is the main reason why the audience members have come to hear you speak. A great tip which you can make use of, in order to break the ice is to tell a joke at the very onset of your presentation. Everyone appreciates a good joke and a joke will help lighten up the mood and encourage the audience members to pay heed to whatever you are saying to them. Beginning on a dull and dreary note will achieve nothing for you; rather you will only succeed in putting everyone to sleep. The success of a presentation is determined by how much a person is able to get through to the people he or she is speaking to, so ensure that you get through to your audience members as best you can right from the start. Most presentations end with a show of hands to see how many people agree with what has been said and how many people are still skeptical on the given topic. Based on the show of hands you can know how many people have been swayed by your words and as opposed to this how many think that your words were not powerful enough to influence them. By doing this you conclude by making the audience feel that the vote counts and that their feedback means much to you. There are many people who find it very difficult to know when they ought to draw the ending line. Their presentations are either too short or seemingly incomplete or at the other end of things, they are too long where people lose interest and do not take in anything which is being said. You must ensure that you know exactly when to stop speaking without burdening the audience with more information than they can take in at one time. A person who is a good speaker can put forth his point effectively in as short a time span as five minutes. Once your presentation is complete and you have said whatever you have to say, you must let the audience speak to you about whatever it is that is going on in their mind. Ask the audience members if they have anything to say or whether they would like to ask you any questions. You can be assured that if you are speaking on a topical issue then people are sure to put forth some pointed questions to you, so be patient and let them complete their question before going on to answer them. Also ask them if they have anything else to offer on the topic in addition to what you have said. If you believe that asking the audience members questions, might be too much trouble as they might put forth a question which you might not be able to answer, so rather than choosing to end in that manner, you can always finish by asking an insightful question, which will allow the audience members to leave the room or the hall, with something to think about. They will carry the question home and start discussing possible answers and solutions. Ours is a technological age and you should try to make the maximum use of technology to assist you in the course of your presentation. There is so much we can do with technology nowadays and while presenting you should not hold yourself back in any way. Make use of pictures, diagrams or videos to really drive the point you want to convey. If you have already shown a number of pictures or videos in the course of your presentation, then you could opt to conclude things with a relevant sound bite on the topic. Appealing the auditory senses of the people is a smart move indeed. What better way to end your presentation by finishing up with a quotation, which has been spoken by some eminent personality. This is something which is bound to appeal to the people and show them that you have indeed done a thorough research for your presentation. Rather than blankly reading the quotation, you should try and memorize it and deliver it in a powerful manner so that the words echo in the mind of the audience much after the presentation is over. Make it a point to modulate your voice when doing so, so that things are even a little dramatic. There is no better way to conclude your presentation, than by appealing to the sensibilities of the people. You must appeal to the people on humanitarian grounds and tell them that without their efforts and initiative, things are never going to improve. You should conclude with a pep talk of sorts in order to ensure that people rise to the occasion and do whatever it is you have been urging them to do in the course of your presentation. At such a time, speaking from the heart would do you a world of good, ensure that your real passion for the topic at hand, shines forth through your words. A presentation is primarily divided into three parts. First is the beginning, followed by the middle and then is the ending. It is imperative to ensure that all the parts of your presentation are well thought of so that things don’t seem uninteresting as well as lacking in information. Yet, the thing is that the beginning and the end of the presentation have to be the most powerful. If your beginning is not good then you will not be able to engage the attention of the audience. Whereas if your end is not good, then the audience will depart without having received anything to think about.